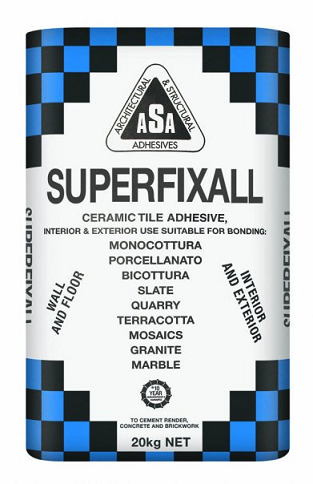 ASA Superfixall is a rigid set, exceptionally high strength, high quality cement based adhesive developed to bond most types of tiles for wall and floor applications. Ideal for bonding monocottura and fully vitrified tiles, as well as natural stone, marble, granite and mosaic tiles onto brickwork, cement render and concrete walls and floors. Suitable for both internal and external, thick and thin bed applications.